Situated right outside of Glenwood, MN, 36 miles away from Hancock Concrete’s headquarters, the Glenwood Pit is the source of rock product for the company’s concrete production. Hancock Concrete, which turns 100 years old this year, designs and fabricates precast concrete box culverts, round and arch pipe, manhole structures, and bridges. In 2011, the company was acquired by nearby Superior Industries, located in Morris, MN. Superior, a manufacturing company founded in 1972 by Neil Schmidgall, engineers and builds bulk material processing and handling equipment and machinery components. In 2015, Superior’s management team began talking about furnishing the Glenwood Pit with new Superior equipment. The pit had been operating for decades and it, “happened to have antiquated products and equipment,” says Jarrod Felton, Superior’s president. 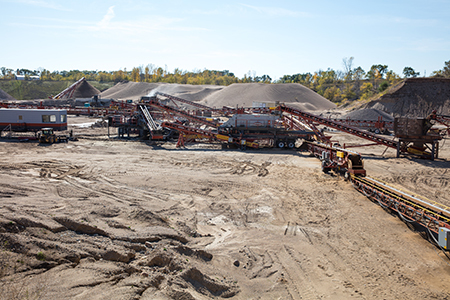 Superior was rapidly expanding their line of products to serve what they call the Rock Face To Load Out™ segment of the aggregates industry. Felton says that Superior’s management thought it would be nice to have a showpiece plant nearby so that customers could visualize what they meant by ‘Rock Face To Load Out.’ Superior was in the process of launching new products for the crushing, washing, and screening markets—expanding on their legacy products, conveyors and conveyor components. Planning for the project began in earnest October of 2015, with newly hired project manager Rustin Mikel acting as a conduit between Superior and Hancock Concrete. He worked with the engineering team and coordinated the product transfer to the site, making sure everything was set up correctly. Two million dollars’ worth of Superior equipment was installed at the Glenwood Pit. New products included the Patriot® Cone Plant, Guardian® Screen Plant, and Twin Screw Aggredry™ Wash Plant in addition to numerous conveyors for material transfer. The Guardian Screen Plant was an especially important addition for the Glenwood Pit. 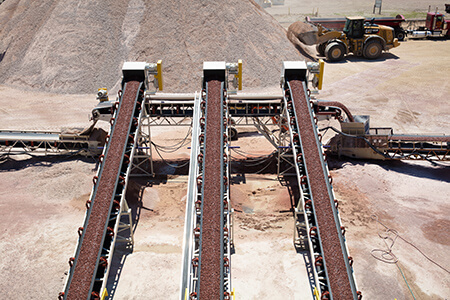 Previously, the pit was operating without a pre-screen, which caused too much product to run through the pit’s washer, resulting in overproduction of material. By screening out a portion of the material and transferring it to a waste pile, the plant operators were able to wash less sand, saving money and lessening equipment wear and tear. 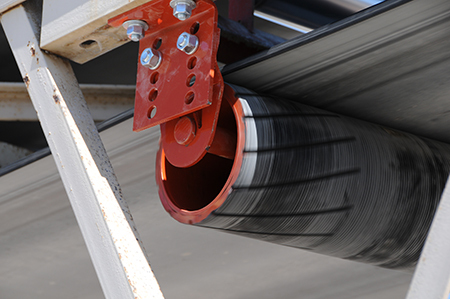 During installation, the crew experienced a few problems with conveyors like oil leaks and guarding issues. Felton said that before the Glenwood Pit project he would have assumed that customers never had any problems with Superior conveyors. He states, “We got to experience all those problems, so we have a much better view of what our customers’ experience is.” Felton explained that often times, customers talk to their dealers and the manufacturer doesn’t get to hear about issues that come up in the field. By stepping into the shoes of a customer, Superior was able to see more clearly how they could improve both the design of their products and their service to operators. 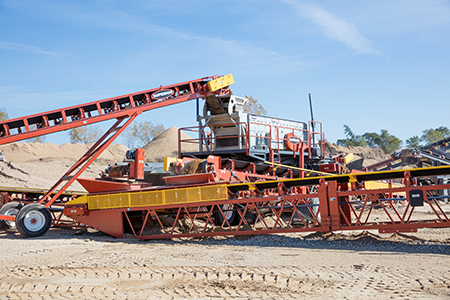 As one of the few manufacturers that has their own sandbox to play in, Superior enjoys the ability to give their engineers access to a fully functioning operation where they can see the machines they design in-application. Superior engineers appreciate the opportunity to test product, conduct research, or observe product issues at any time. “I can relate to that myself. When I was a design engineer any field experience I could get was vastly beneficial,” says Felton. Before the project, Superior engineers in-field opportunities were few and far between. 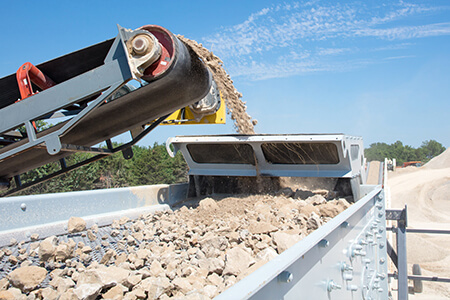 When a gravel pit in the area did some contract crushing work, the engineers would pile in a van and drive over to get a look. “Now we don’t have to wait for those opportunities. We just go over to Glenwood whenever we want,” says Felton. Superior sales representatives also benefit from having access to the Glenwood Pit. Being able to bring customers to the pit gives the Superior brand credibility. Felton states, “There’s a difference between an actual operation and a staged showpiece where everything is shiny and clean. We’re actually producing for a real business purpose.” Exhibiting equipment under the demands of day to day operation brings added value to customers who want to be certain that their investment in a Superior machine pays off. All the equipment at the site is for sale. Customers get the convenience of having a slightly used product shipped to them right away instead of waiting a couple months for a new one. Felton explains that the company’s goal is to rotate the equipment out every two years so the newest, latest, and greatest products are always on display. 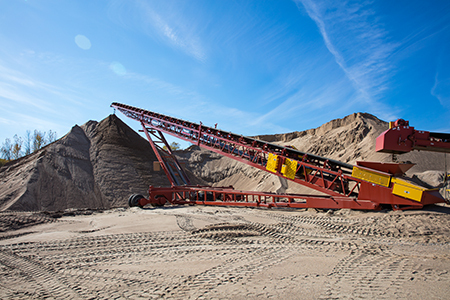 Superior Industries tests their new equipment and construction management services in their own project— a refurbish of Hancock Concrete's gravel pit in Glenwood, MN. Copyright 2019 Superior Industries, Inc.